Families can save money by staying put. SAN DIEGO (KGTV) - Want to enjoy your time off but you’re on a budget? 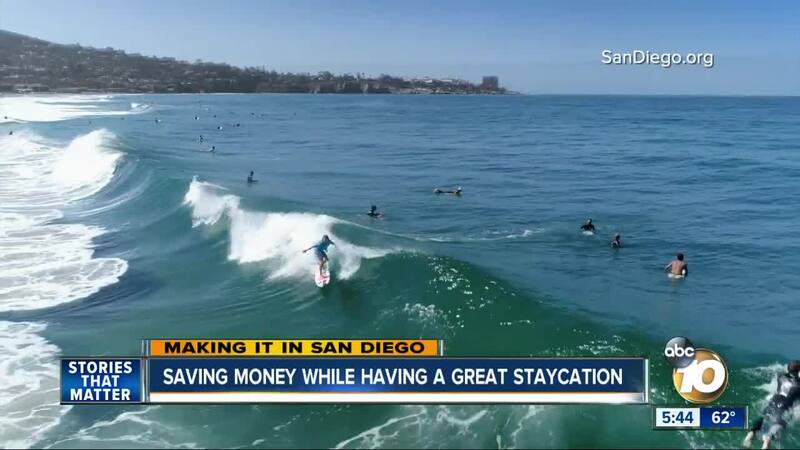 San Diego and Carlsbad are among the top ten cities in the nation for staycations. San Diego County’s beautiful landscape, sunshine, activities and theme parks drew 35 million tourists to the region in 2018. When Porch.com tallied the number of staycation hashtags around the country, Carlsbad came in third for locals finding another world in their own backyard. San Diego came in tenth place for its bay, boardwalk, and world-famous San Diego Zoo. Kerri Kapich, COO of the San Diego Tourism Authority, says San Diegans love the outdoors and doing something a little out of the norm. “And to camp and have that experience, take your kids, get on the beach, stay overnight, have a campfire, its a really fun experience,” said Kapich. 7 percent of hotel rooms in San Diego are taken by locals who leave the house, and sometimes the car behind to feel a million miles away without the cost of an airline ticket. San Diegan Edna Gutierrez chose a staycation at a hotel by the bay when her father was visiting from out of town. “And I've never been a morning person, and I would wake up early every day so I could walk to the bay....take it all in, in the morning,” Gutierrez said. “So if you can have an escape where someone is going to make your breakfast, make your bed...spoil you a little bit...that's a nice thing to have,” Kapich said. “It changes your perspective because sometimes you don't take advantage of the things you have in San Diego,” Gutierrez said. San Diego native Robert Arends chooses to take vacations two hours away in East County. “It’s pretty close, whole ‘nother world…desert oasis to yourself,” said Arends. Arends said many San Diegans don’t know about the small town of Borrego Springs, where he goes to recharge. “There's this isolation and peace and calm out there, that's a little different from the hustle and bustle of being on the coast,” said Arends. This year’s wildflower super bloom is drawing crowds but Arends plans to brave the traffic and bring back beautiful photos. Wondering where to get away? Check our 10News Exploring San Diego section for top entertainment picks and a list of staycation ideas around San Diego County. You can also find discounts on hotels, food and attractions at Visit SD .